Yvonne travels to Coober Pedy in Australia every few years so that she can select the very best coloured opals, she also purchases rough opals and cuts and polishes them herself which enable her to produce more unusual shapes. 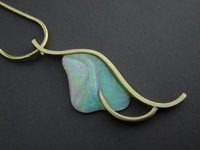 You can purchase a stone from the stock of un-set opals and have a bespoke piece of jewellery designed and made to suit your requirements. Please telephone to make an appointment to view the stones in stock. Click on an image to toggle enlargement. 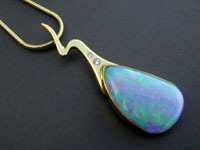 This 9ct yellow gold pendant has an unusual triangular shaped 0.95ct opal with a bright fiery glow. 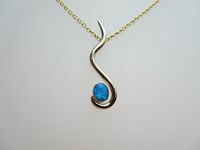 Opposing flowing lines make it an elegant statement piece and the 18 inch trace chain passes through the loop of the pendant. 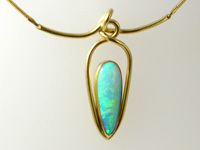 A 9ct yellow gold pendant in a very simple flowing shape, designed to show off this vibrant 0.85ct blue opal. An understated piece that can be worn every day. 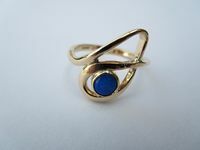 A 9ct yellow gold flowing and graceful design encapsulating a round 0.50ct blue opal. 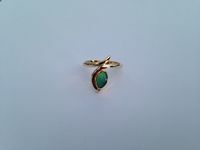 A 9ct yellow gold dress ring with a marquise shaped blue and green 0.76ct opal weighing. This unusual angular cut 8.54ct opal inspired me to create a truly arresting design that really makes a statement. I have used a satin finish on the gold to emphasise the ‘solidity’ of the design, the four diamonds have been carefully placed to visually continue the line of the chain. The chain is supplied separately, 16 or 18 inches long. 12.58 carats of deep blue and green opal. Beautiful stones beg for simplicity, so I produced a simple swaying design leading the eye to the main star, with a couple of flush set diamonds as pointers on the way, polished finish. A vibrant blue-green 6.17ct opal with a marked luminous quality, that is suspended within intertwining wires of satin finish gold. The loose knot design produces a 3D effect that is both elegant and sensuous. 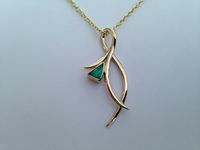 This pendant has an integral 18ct gold chain. 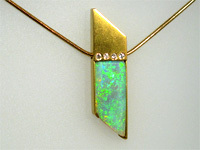 8.60 carats of Coober Pedy opal, with a graduation of colour from pinks through to blue-green. The stone is carved with sensuous curves that I have echoed simply in the gold body, with one claw anchoring the stone in place along the carved recess, satin finish. 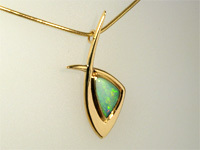 This flamboyant pendant design is inspired by the unusual triangular cut 3.12ct opal. The result is a design that intentionally hangs asymmetrically and has great flair and elegance. The polished finish of the gold gives the metal ‘lightness’ with beautiful reflections. The chain is supplied separately, 16 or 18 inches long.